So I’m not really huge on the internet, or internet-related tests and whatnot, but this made me pretty happy, as I am a huge fan of the ol’ Achewood. You’re Roast Beef! You’re brilliantly smart but cripplingly anxious and/or depressed, depending on the day, and as such, you’re the level head of your circle of friends, the one whose reservations keep people from trying to catch ninja stars with their teeth and whatnot. You can be prevailed upon to cut loose from time to time, at which times you enjoy dressing up like historical figures and freestyling about their characteristics. You’re a sharp, talented cat, and your recent successes getting out from under the thumb of your domineering grandmother and proposing to your significant other are admirable, but let’s face it — no dude who has a Nervousness Blanket to throw up under is gonna make it that far without some serious pharmaceuticals, am I right? 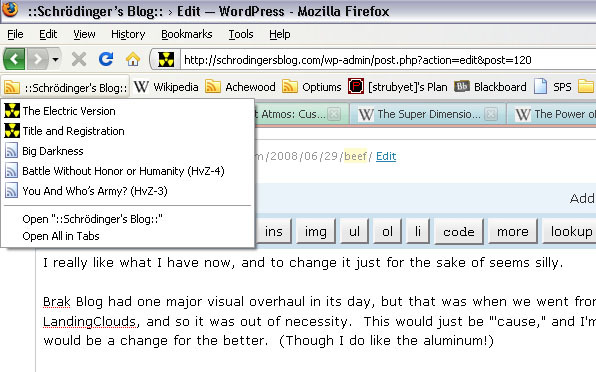 As mentioned on the previous entry, I’m hard at work getting the 2.5 version of Schrodinger’s Blog put together. A lot of cool features coming up, and also just some book-keeping/housework type of things too. It’s still a ways off though. 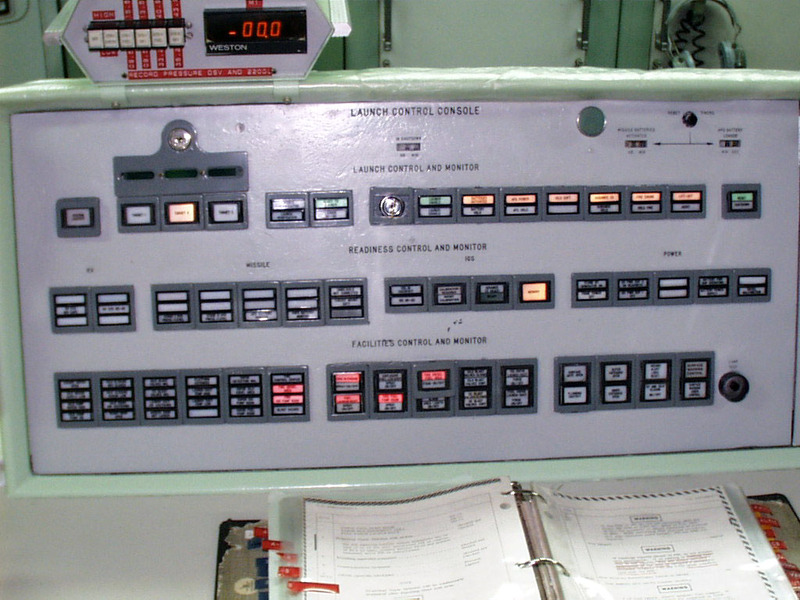 The plan for the overhaul was to simulate the look of a nuclear launch console. I based my design roughly off of this picture. However, the barrier I keep running into is my Adobe PS skills are only what they are. I’m no whizz at the thing, and I don’t really have any training/talent in artsy things. You can see different manifestations I played with; the leftmost button is “pushed”, and lit up red. The second one I tried for a more realistic backlight, with a textured surface and a washed out yellow light color. The second two have a different orientation of the text, and are “unlit” or “unpushed” buttons. So. That was the first idea. I showed this to Ethan though, and his comment was that he liked what I had now. And so I thought to myself, ‘I should just polish up the current design.’ What better to make something look fancy than adding brushed aluminum. You can see my stab and making an aluminum textured surface on which to place the buttons. The leftmost is “pushed” with a red ring around the edge. This and the aluminum were attempts to make the style similar to a real elevator, which the design is patterned off of. In the end though, I dunno. I really like what I have now, and to change it just for the sake of seems silly. So ultimately, I scrapped the idea to do any major graphics work, but I thought I’d share some of the failed drafts with you guys. This is pretty useful to follow like, maybe one or two blogs or webcomics. The problem, at least for me, was that I started to want to keep track of too much stuff. That bar is only as wide as the browser, and then things trail off into side menus, and it’s not nearly as convenient. 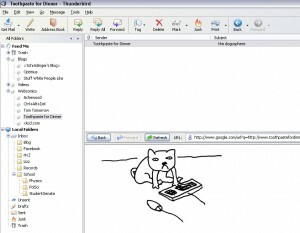 The one thing that helps is an add-on called ThunderBrowse. This allows the message pane (where the little dog is in the above picture) to function like an internet browser. 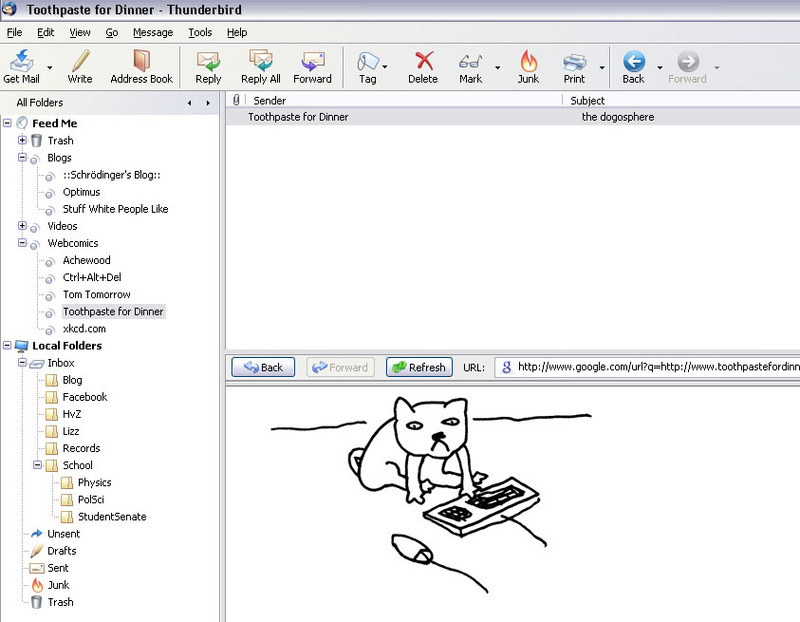 So when your feeds come into the program, they look like little e-mails with links in them; ThunderBrowse allows you to click that link, and visit the page inside the e-mail client itself! Which is pretty cool. I know maybe that sounds a little complicated, but the alternative is visiting the sites you see in the panel at left constantly, multiple times a day to see if they’ve updated, which had started to become a problem for me. Now, I just open up my e-mail, and it tells me exactly how many times each site has updated. 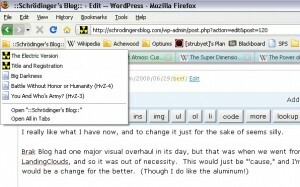 However, if using Thunderbird seems to daunting (and I’ll be frank, the add-on is a little difficult to install), try Google Reader. Ethan uses that to sift through hundreds of updates daily, and he really likes it. Plus, it’s web-based so you can always read it, and it’s pretty simple to set up.